Our coaches to the matches at Braintree Town next Saturday and York City on Tuesday March 21 will definitely be running. Thanks to Charlie Clapham subsidising the coaches, we’re able to ensure they run at a reduced price. The fare for the Braintree coach is just £15 members, £17 non-members. It leaves the Merseyrail Community Stadium at 8am. The York coach is priced at £10 members and £12 non-members, leaving at 3.45pm. To book, text Bill Sloan on 07952056385. A reminder that it is against the law to have alcohol on a football supporters’ coach. 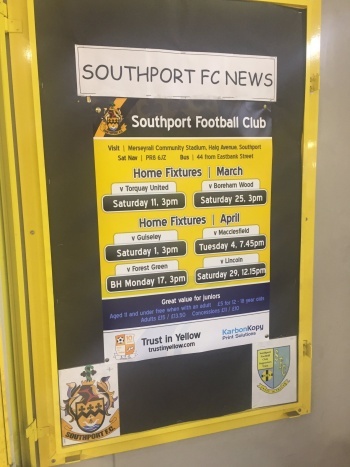 We have a new poster in our display cabinet at Southport station to advertise the remaining fixtures this season. Thanks to Merseyrail for giving us the use of the space and Karbon Kopy for printing the poster. The poster is by the ticket barriers on the entrance to the platform. Since Charlie Clapham has generously offered to subsidise our remaining coaches this season we are able to reduce the prices for our Braintree and York coaches by 50%. Places need to be booked by this Saturday so we can confirm the coaches. A reminder that it is against the law to have alcohol on a Football supporters coach. Our coach to Maidstone United this Saturday will definitely be running. We are able to run the coach at the reduced fare of £23 members, £18 under 16 members and £25 non-members. A reminder to supporters that it is against the law to bring alcohol on these coaches.